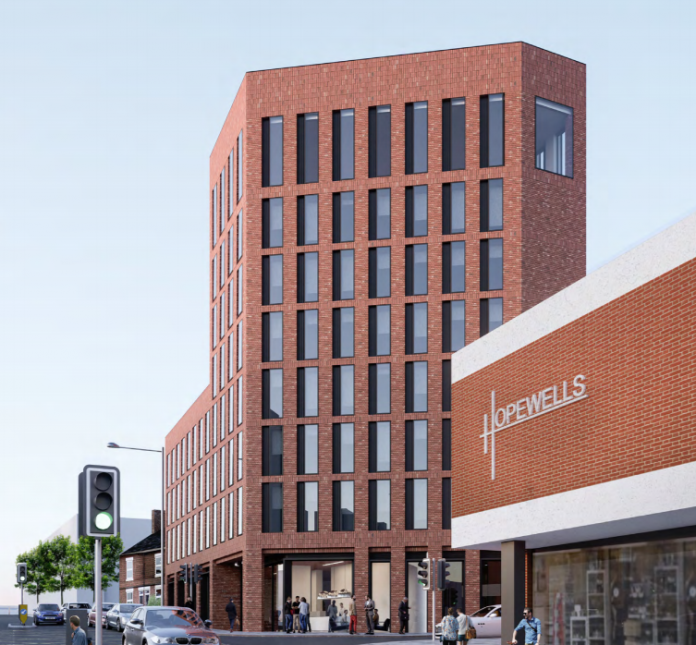 Approval has been granted for a 301 bedroom student accommodation scheme on Huntingdon Street, Nottingham. The plans, from Aspbury Planning Limited on behalf of a Ms Rachel Warren, look to demolish the existing buildings on the site to make way for student accommodation of varying heights, and a maximum of 8 storeys. The site is currently occupied by Aura Designer Furniture (a single-storey building which fronts Huntingdon Street), while the remainder is used as car parking and for two separate commercial single storey storage buildings. The scheme will consist of cluster bed apartments, twin clusters, studios and townhouses. There will also be communal amenity and study areas, a front reception and offices, a laundry room, and cycle and refuse storage areas. A council document states: “The application site is conveniently located within a short walking distance of Nottingham Trent University campus and the city centre amenities. “It is considered that the provision of good quality purpose built accommodation in this location will attract students that could otherwise occupy houses of multiple occupation outside of the city centre.